The documentary The Myth of the Liberal Media: The Propaganda Model of News uses empirical evidence to look at ownership of the mainstream news media, filters that affect what news gets published, and examples of actual news coverage in order to show that conservative political and corporate interests significantly shape news coverage in the United States. Searching on subjects such as "Mass media -- political aspects" or "Mass media -- objectivity" will bring up additional viewpoints and sources on this topic. There is no completely clear answer to this question because there is no one exact methodology to measure and rate the partisan bias of news sources. All Sides is a news website that presents multiple sources side by side in order to provide the full scope of news reporting. The Allsides Bias Ratings page allows you to filter a list of news sources by bias (left, center, right). AllSides uses a patented bias rating system to classify news sources as left, center, or right leaning. Components of the rating system include crowd-sourcing, surveys, internal research, and use of third party sources such as Wikipedia and research conducted by Groseclose and Milyo at UCLA. Note that while the Groseclose & Milyo results are popular, the methodology it is not without critique. Survey data reveals the news source favored by people according to their political beliefs. A report based on a 2014 survey shows which news sources are used and considered trustworthy based on individual's political values (liberal or conservative). Note that this report measures the political leanings of the audience rather than the source itself. An interactive tool from the Wall Street Journal that allows you to "See Liberal Facebook and Conservative Facebook, Side by Side"
The Blue Feed, Red Feed tool relies on data from a large study of Facebook users conducted in 2015 by Bakshy, Messing, & Adamic (UM-Flint Library Access). The ideological alignment of news sources on Facebook was measured based on the stated ideological affiliations of users who interacted with the content. Here are a few examples of major news sources and their so-called "bias" based on ratings from AllSides (as of March 2017) and the reported level of trust from partisan audiences from the Pew Research Center survey. Note that much of these ratings are based on surveys of personal perceptions. Consider that these may be impacted by the hostile media effect, wherein "partisans perceive media coverage as unfairly biased against their side" (source: Perloff, R. M. (2015). A three-decade retrospective on the hostile media effect. Mass Communication and Society, 18(6), 701-729. (UM-Flint Library Access). Daily business-focused newspaper based out of New York City. The Wall Street Journal has a bias rating of "Center" according to AllSides. The Pew Research Center found that the Wall Street Journal is read by people of all political leanings and is the only news source that is more trusted than distrusted by people all across the political spectrum. There is, however, some debate but it has been accused of being biased to both the left and the right. The British Broadcasting Corporation News division produces television, radio, and internet news. The BBC is a public service broadcaster established by a Royal Charter of the United Kingdom. The BBC News has a bias rating of "Center" from AllSides. According to Pew, BBC is more trusted than distrusted among the different ideological groups except for consistently conservative individuals who view BBC as about equally trusted as distrusted. American daily newspaper that provides both news and entertainment coverage. USA Today has a bias rating of "Center" from AllSides. According to the Pew survey, USA Today is more trusted than distrusted among the different ideological groups except for consistently conservatives who view USA Today as more distrusted than trusted. The following news sources are rated as "Center" by AllSides and are noted for stating an independent and unbiased agenda, as well as consistently providing balanced coverage (giving time to both sides of an issue). However, they are listed here as almost center because of audience distrust from conservatives. Respondents to the Pew survey who are consistently liberal, mostly liberal, and mixed views, rated these sources as more trusted than distrusted. Mostly conservatives rated them as about equally trusted as distrusted; Consistently conservatives rated them as more distrusted than trusted. National Public Radio is a U.S. private and publicly funded non-profit organization that syndicates to a network of local stations. The Public Broadcasting Service is a non-commercial U.S. television broadcaster and distributor. A key finding from the Pew survey is that conservatives have a higher level of distrust overall of news sources and consume a much narrower range of news sources. 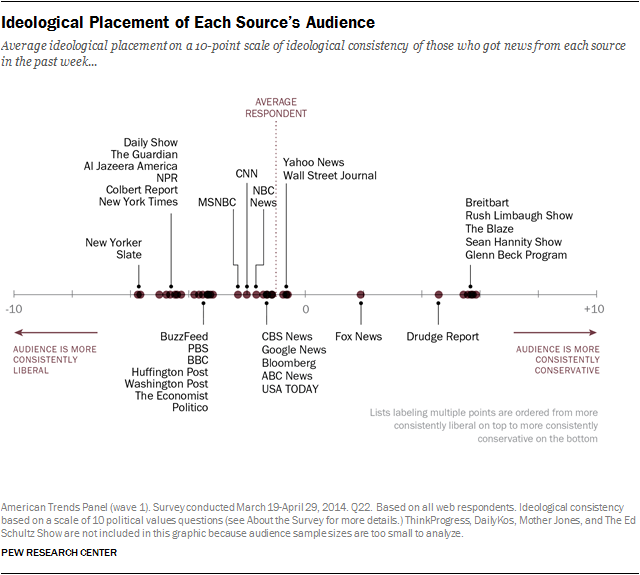 Liberal audiences trust and consume a broader range of news sources. Therefore, there are more news sources that are rated or perceived as center-left/slight left leaning (especially mainstream sources); there are fewer news sources that are center-right. This represents the popular conservative discourse that the mainstream media has a liberal bias (and potential hostile media effect). These news sources are rated as "Lean Left" by Allsides. According to the Pew survey, they are more distrusted than trusted by people who are mostly conservative and consistently conservative; and are more trusted than distrusted by people who are mixed, mostly liberal, and consistently liberal. American daily newspaper published since 1851. American daily newspaper published out of Washington D.C. since 1877. These news sources are rated as "Left" by Allsides. According to the Pew survey, they are more trusted than distrusted by people who are mostly liberal, consistently liberal; and are more distrusted than trusted by people who are mostly conservative, and consistently conservative. American news aggregator and blog founded by Arianna Huffington in 2005. American news and culture magazine first published in 1976. These news sources are rated as "Right" by Allsides. According to the Pew survey, they are more distrusted than trusted by people who are mostly liberal and consistently liberal; and are more trusted than distrusted by people who are mixed, mostly conservative, and consistently conservative. Note that this represents a further bias leaning than the "towards the left" sources. There are no direct parallels on the right. American news television channel headquartered in New York City and created by Rupert Murdoch in 1996. These news sources are rated as "Right" by Allsides. According to the Pew survey, they are more distrusted than trusted by people who are mostly liberal, consistently liberal; and are more trusted than distrusted by people who are mostly conservative, and consistently conservative. News aggregation site founded by Matt Drudge in 1996. << Previous: Why is this important?